08-Sep-2018 -- I had already visited this point 12 years ago, but - while driving along the Oregon coast - I tried to revisit it, in the hope of getting a bit closer to 'all zeros' than I did last time. 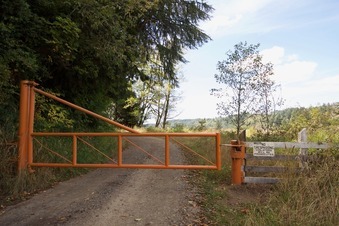 Unfortunately, the gate across the access road - 0.27 miles from the point - is now signed with a "No Trespassing" sign, so I couldn't get any closer. #1: This gate - 0.27 miles from the point - was present during my last visit, 12 years ago, but it's now signed "No Trespassing"